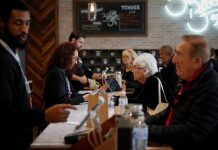 Trenton, N.J. (AP) – The Food and Drug Administration has approved the first inhaler combining three medicines to ease breathing in patients with emphysema or chronic bronchitis. 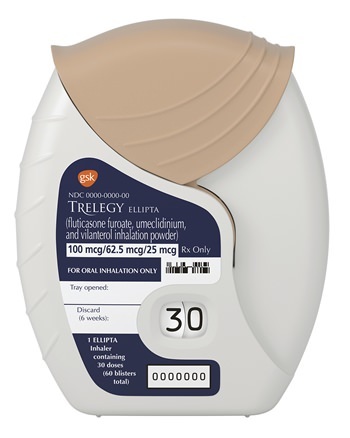 The FDA late Monday approved sales of Trelegy Ellipta, developed jointly by GlaxoSmithKline PLC and Innoviva Inc. It contains three widely used types of medicine to prevent – rather than treat -flare-ups of the life-threatening breathing disorders. The disorder worsens over time, requiring patients to add more medicines to prevent flare-ups that can land them in the emergency department – or worse. Many patients use two inhaler types plus other medicines. An estimated 384 million people worldwide have chronic obstructive pulmonary disease, or COPD, which can make everyday activities such as walking up stairs difficult. It’s usually caused by cigarette smoking or exposure to secondhand smoke, chemical fumes or excess dust in the environment. The product’s approval, the fourth for a Glaxo inhaler since 2013, should help the company rebuild its flagship respiratory medicine business. It was long a leader in the category, thanks to its widely used allergy drug Flonase and its Flovent and Advair inhalers. Flonase has generic competition now, and the drugmaker now sells a nonprescription version. Flovent, launched in 1994, has seen sales cut by newer inhalers, including Glaxo’s products. Advair, which provided about one-third of Glaxo’s revenue for many years, also has seen increasing competition in recent years. Advair sales are down by more than half since their peak of $8.15 billion in 2011 and are expected to decline to just $1.43 billion by 2020. The Incruse and Breo inhalers, both launched since 2014, and the Anoro inhaler launched in 2013 have barely made up for one-sixth of that lost revenue.